PORTOLA, Calif. /California Newswire/ — Agru America, Inc. today announced that the city of Portola, Calif. is now using its exclusive EPA Subtitle D compliant landfill closure system – ClosureTurf(R). 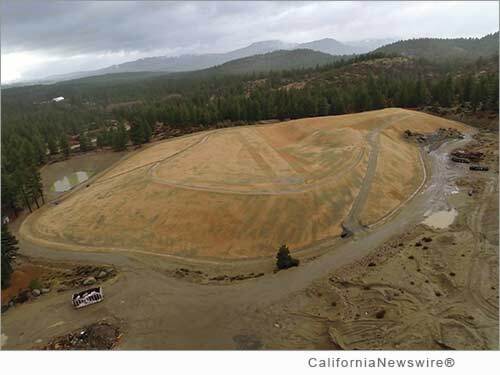 The landfill site located in the Sierra Nevada Mountains, recently completed an eight-acre final closure. The site is the second application in the state to use ClosureTurf(R), specifically designed to eliminate soil erosion, reduce post-closure maintenance costs, increase slope integrity and enhance landfill gas (LFG) management. Throughout the process, Agru and its partner, Watershed Geosynthetics LLC, provided the city council and public with support on implementing the state's approved ClosureTurf(R) system for use as a final cover for the landfill. During the process, questions arose. For example, cost was a concern. While the construction cost of the system was similar to a traditional Subtitle D closure, the City of Portola would actually save on future maintenance costs, while reducing the environmental impact and improving safety and performance. Officials at the landfill had to address significant challenges including ground water issues and a short construction window. The project was bid in August 2014 and installed in just six weeks that fall. This included the removal of the temporary liner along with subgrade preparation and installation of the entire ClosureTurf(R) system. Todd Roberts, director of public works for the city said, "Everyone involved with the project was great to work with and we were happy with the installation of the system. Everything is performing as expected." Tom Valentino, PE, president of TGV Solid Waste, Inc., Portola's solid waste consultant, reported that prior to ClosureTurf(R) becoming available, they had looked at the traditional Subtitle D vegetative cap. However, one of the greatest advantages of ClosureTurf(R) was avoiding long-term maintenance costs. Ease of installation was also a plus because the city was under tight time constraints to get the project completed. "Coincidentally, there was a storm the night the project was completed and we got the project done on time," Valentino said. "We chose a tan color that blended with the surroundings. From a short-term stability standpoint and a long-term post closure maintenance cost, the ClosureTurf System was the absolute right decision to make for the Portola landfill." Additionally, the landfill is located in a seismic zone with potentially high snowfall events. In the event of seismic activity or significant snowfall melt, the soil used in a traditional capping system would present a significant slide hazard. Cal Valley Construction (Fresno, Calif.) was the general contractor and infill installer, along with D&E Construction (Visalia, Calif.) – the approved ClosureTurf(R) installer. "From a construction quality assurance perspective, installation of the ClosureTurf cover system required less field personnel during construction than a traditional prescriptive cover system and saved the city money," Jake Russell, P.E., Geo-Logic Associates, Portola's CQA consulting firm, said. "The installation of the ClosureTurf cover was completed in significantly less time than other similarly-sized prescriptive subtitle D vegetative cap landfill cover systems in which I have been involved. By removing the soil components of the cover system, construction issues associated with the variability and availability of soil materials were eliminated." ClosureTurf(R) is an innovative and economical final cover system designed for waste containment which eliminates soil erosion, increases slope integrity, enhances gas collection, and lowers maintenance costs. ClosureTurf was developed by Watershed Geosynthetics LLC and is sold exclusively by Agru America, Inc. First installed in 2009, this innovative technology has continued to gain more acceptance in the waste industry as an increasing number of owners, agencies and engineers have approved its use in multiple states over the past five years. Once installed, a landfill is converted from a mountain of unsightly trash to one that is much more aesthetically pleasing. Since 1988, Georgetown, S.C. based Agru America, Inc. has been the world's leading manufacturer of flat die extrusion geomembranes, geonets, geocomposites, geotextiles, geo clay liners, concrete protective liners and fittings. Agru America also supplies vertical barrier systems and piping systems for the U.S. and international civil/environmental markets. The company's state-of-the-art products include Agru Smooth Liner(R), MicroSpike(R) (structured textured products), Super Gripnet(R), and Drain Liner(R) in both LLDPE and HDPE. Agru America is part of Alois Gruber GmbH, an Austrian family-owned business since 1948 with production facilities in Austria, the U.S., Germany, China and India, and distribution in more than 80 countries, worldwide. For more information, visit: http://www.agruamerica.com/ .